BMET Job Opportunity 2018. 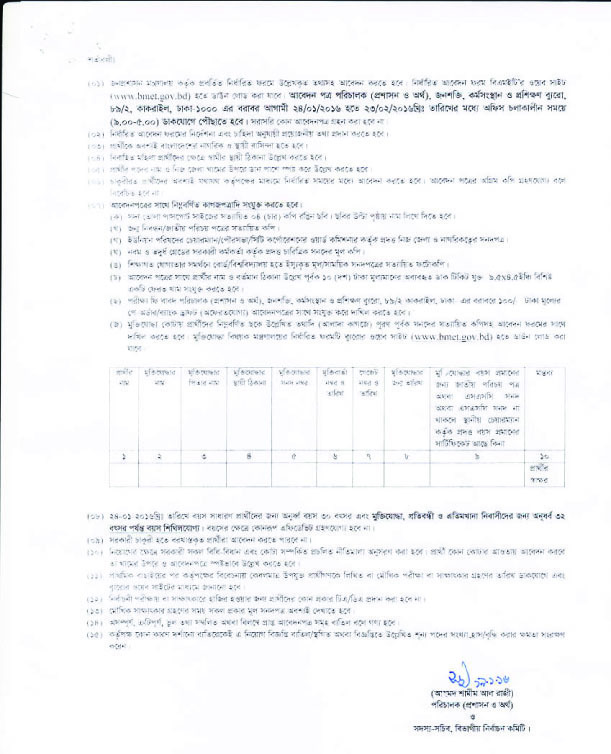 Bangladesh Bureau of Manpower Employment and Training (BMET) has been publish a job circular on 20th January 2016.The authority of BMET was decide to post 95 people in 14 categories.The circular was publish official website of BMET www.bmet.gov.bd.you can found it here. The authority of Ministry of Expatriates Welfare and Overseas Employment has been published a job circular under Bureau of Manpower Employment and Training (BMET). Job circular download link given below. Academic Qualification: Base on Job Categories. Age Limit: Maximum 30 year. Dead line: 23th February 2016. Ministry of Expatriates Welfare and Overseas Employment offer a job for all Bangladeshi citizen who has availability to apply for this job. Applicant must use the authority provided form. Need a 100tk Bank pay order/ bank daft. Married Female Candidate must give the permanent address of his husband. Applicant must write his name and post name on right side of the envelope. 4. Certified character certificate hard copy. 5. Citizenship Certificate one copy . 7.unused 10 Tk. post card with a envelope that has to write applicant name and address. Application form must reached on 23th February 2016 at 5:00 pm.